Temperatures are dropping, and the nights of whiskey-drinking, Americana folk music are upon us. For November’s SLUG Localized The Hollering Pines, Winter Grain and Mia Grace are teaming up to fuse the blues with rock n’ roll and country croons to satisfy local music lovers. Localized is generously sponsored by Uinta Brewing, High West Distillery, KRCL 90.9 FM and Spilt Ink SLC. Roll by the Urban Lounge on Nov. 16 for the always free, 21-plus show, and indulge in some of Salt Lake’s finest tunes. I settled in with good people, good music and the charm of a guitar- and art-filled living room while former Canyons members Kate Anderson and Secily Saunders ordered pizza. Like most people, I was bummed to hear about the breaking up of Canyons but was thrilled to hear it wasn’t a fatal rockslide. Instead, they’ve been busy: busy emerging from the ashes, busy recording at Bear Creek Studios, busy forming Winter Grain. Winter Grain are in its infancy. 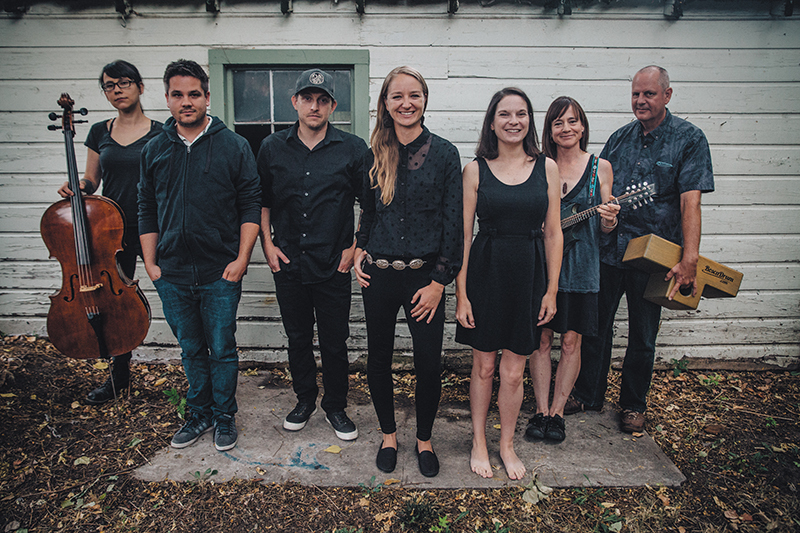 They formed in January 2017 and, just one month later, recorded their first EP, Winter Grain (for which they won a 2017 City Weekly Best of Utah award). 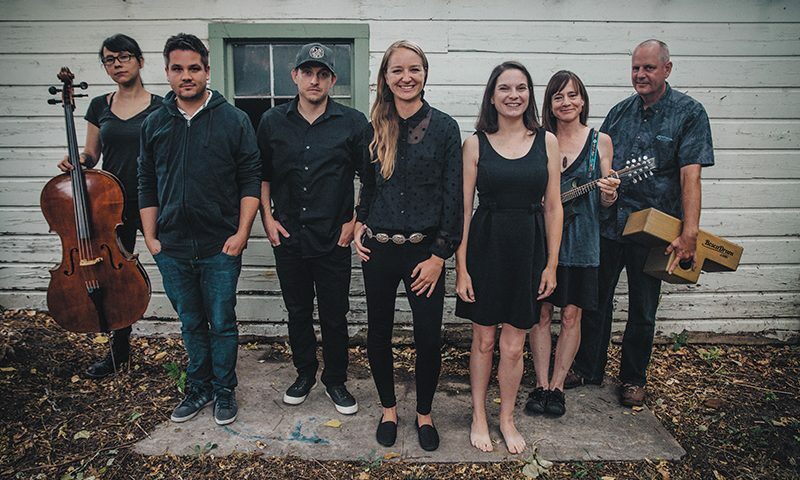 In late 2016, Secily (vocals, guitar, and piano), Kate (lead vocals and lyricist) and Tim Neu (guitar), a former Canyons member and metalhead-gone-bluegrass, refused to let good music slip away. Instead, they laid it all on the line: They compiled 20 songs into a demo and sent it to Bear Creek Studio’s Ryan Hadlock, who produces for bands like Foo Fighters, Train, Brandi Carlile, Vance Joy and The Lumineers. Hadlock extended an invitation to Secily, Kate and Neu to record, despite their not having a band name yet, let alone a label. “We started dream-thinking about who we wanted to play with and started reaching out to them,” says Kate. The first to join was cellist Melissa Collins, who then recommended Tara Shupe (fiddle, mandolin), both of whom work fulltime at Summerhays Music making instruments. Kate describes folk pop as capitalizing on the “earworm,” the catchy pop part of a song. “But when you have instruments like fiddle, mandolin and cello, you can’t help but be folk-like,” she says. They’re refurbished songs with powerful imagery and narratives, recorded by a refurbished band. “I’ve never been in a band with such fast and promising growth,” says Kate. Winter Grain have grown in flair but also in figure, adding two more to the band. They wrangled in long-time musical friends to do more than play a few gigs. Bassist Rob Alvord joined in June, sharing his time with local band Fat Candice. Drummer Tim Mills, owner and maker of Bosca Drums, joined in August. With seven members, Winter Grain have added more depth, more claps and more stomping. Salt Lake City music seekers are on the prowl for good music, and Winter Grain want to deliver. “We want people to hear our recorded stuff first, and we want to play shows,” says Secily. “But we’re not interested in ‘the hustle’ because we’re all so busy in our lives being in other bands and working full-time jobs.” So, going on tour and playing a laundry list of shows isn’t a priority right now. Winter Grain are focusing on creating more EPs in lieu of full-length albums and playing periodic live shows or 30-minute showcases—“brief, yet stunning products,” says Secily—the classic quality-over-quantity illustration. While they may play fewer standard-venues shows, each show or appearance is with purpose and sincere intention, like playing at Tom Taylor rallies, on KRCL and releasing their EP during a laser show at the Clark Planetarium’s dome theater. They plan to continue to use music as a means to connect with and contribute to the community and local music scene, and that’s what SLUG Localized is all about—so don’t miss the opportunity to stomp and clap with one of Salt Lake City’s emerging bands.